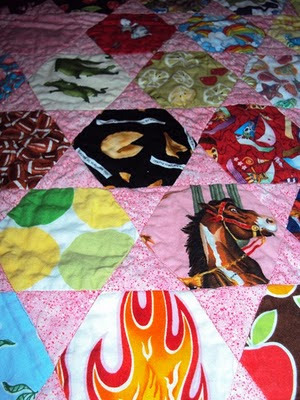 This quilt is proof positive that ignorance is bliss! I wanted to make a meaningful gift for Elle's second birthday... something that she would have for a long time to come, something handmade by her Mommy, and something we could enjoy together. 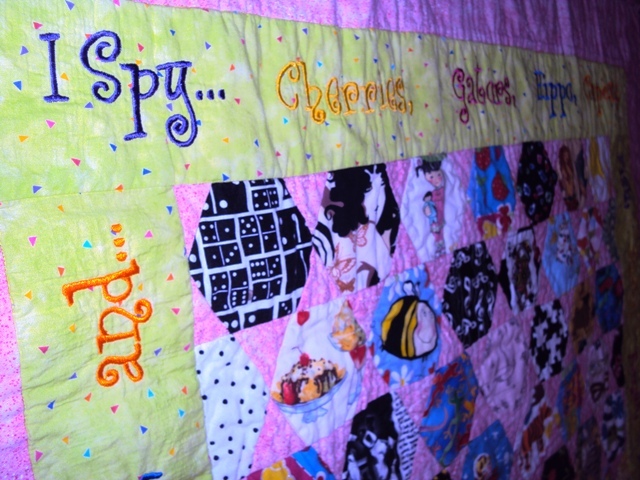 An I Spy quilt fit the bill perfectly! 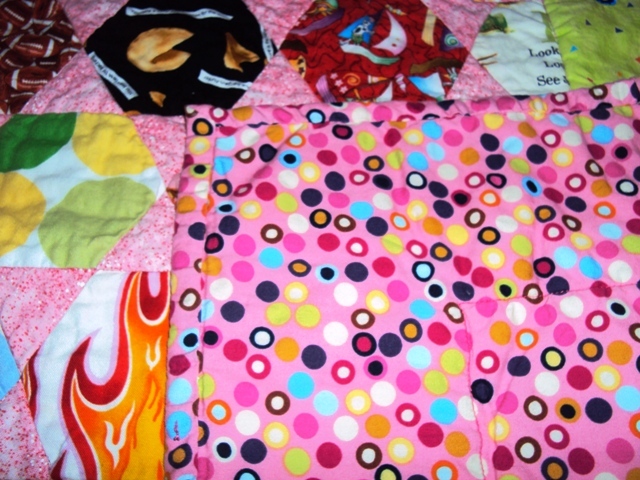 I didn't even consider that it may be too much to tackle for my very first quilt and one of my very first sewing projects ever. 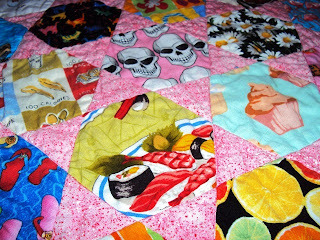 I started by collecting fun fabrics. I asked for scraps from my friends who sewed, I bought strips of fabric as narrow as Jo-Anns would sell them to me, I even begged Etsy shop owners, who had fabric I couldn't find, to send me their scraps (some of them actually obliged... dear sweet Etsians!). 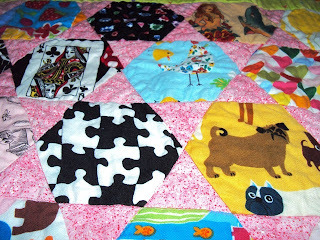 Once I had gathered all my I spy fabrics I bought a kit that came with two plexiglass pieces, a hexagon & a triangle. Then I started cutting and cutting and cutting and piecing. Once all the hexagons & triangles were pieced together, I cut the strips for the green border, picked the font for the embroidery, and printed a bunch of templates of the words I considered embroidering along the border. 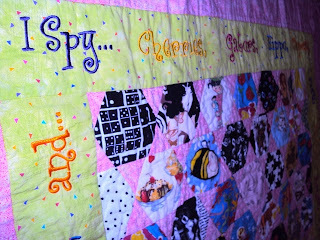 I layed all the words out along the border strips until I got just the right combination. 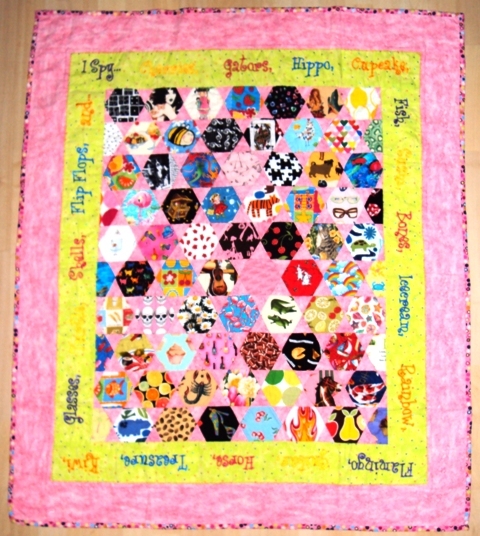 It says "I spy... cherries, gators, hippo, cupcakes, fish, sushi, bones, icecream, rainbow, flamingo, guitar, horse, treasure, kiwi, glasses, turtle, shells, flip flops, and..." Then I embroidered and embroidered, and embroidered, and sewed. 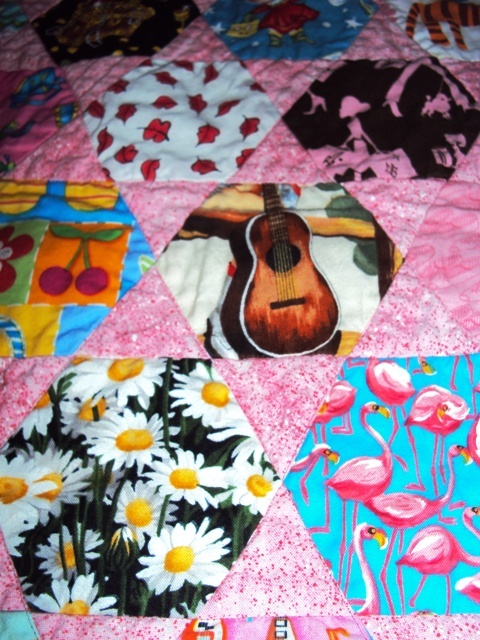 If I knew then what I know now about sewing and quilting, I never would've tackled that project. I was so proud of myself that it all came together in the end, but I'm even more proud of myself now that I know what an accomplishment getting all those hexagons and triangles to match up just so, not screwing up all those embroidered words, and getting everything facing the right direction is! Last but not least, I have to mention that I never posted about this project because it was unfinished for so long. 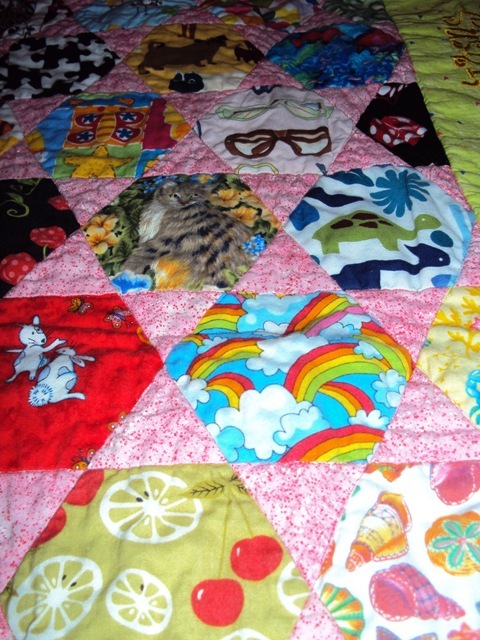 I did all the piecing, quilting, and sewed on the binding, but I fused the binding down & in my opinion, hand sewing the binding is really the only way to go. 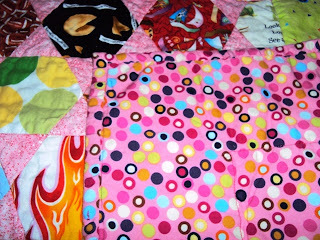 If you've been following this blog, you know I ABHOR hand sewing! I was really stubborn about finishing this quilt all on my own, until it didn't get finished for 3 years. I finally asked my good friend Ann, quilter and blogger extroidanaire, if she would have pity on me and sew the binding. She graciously agreed and waalaa a big fat check on my 2011 to do list! 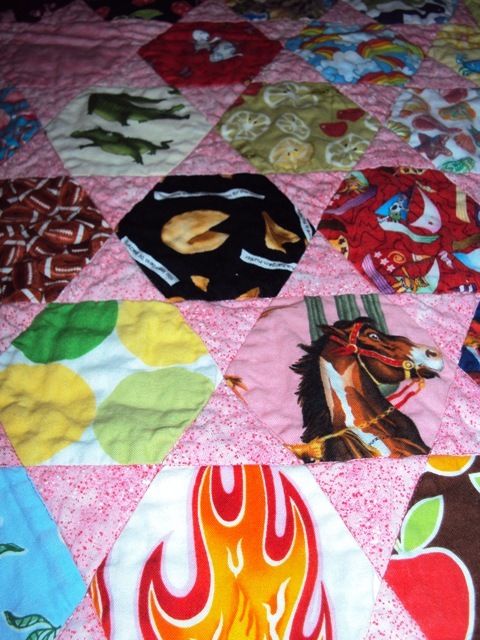 Thank you Ann, I feel so fortunate to have you as a friend and quilt mentor! 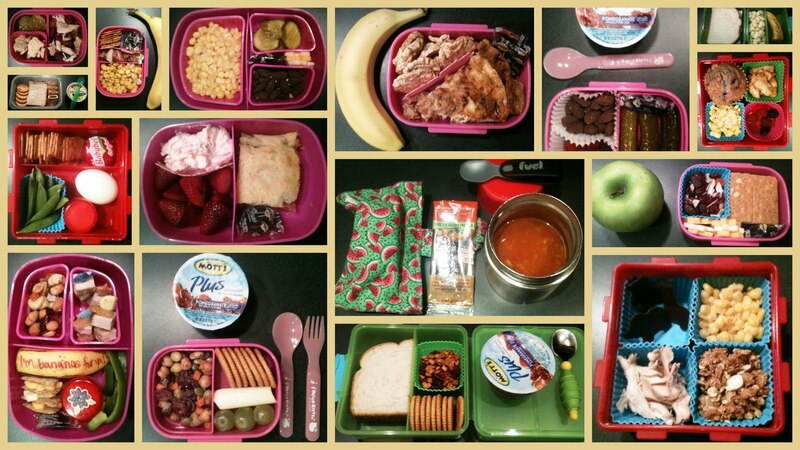 pickles, animal crackers, chicken & dried cranberries, fig newtons, ritz crackers, almond butter & jam sandwich, apple sauce, corn, pork, crackers, prunes, banana, cheese, almonds, rice cakes, quiche, raspberries, pirate bootie, muffins, fruit snacks, hard boiled egg, snap peas, stromboli, strawberries & whipped cream, soup, fruit leather, apple, trail mix, graham cracker, pineapple, nuts, green pepper, chick pea salad, cheese sticks, grapes, lunch meat rolled up, or ganola!? Add my lovely "Your Way Wednesday" button to your blog or blog post that you link up to Please link directly to your blog post, not a giveaway, your link party, your Etsy shop, or even just the home page of your blog. In exchange for following the rules, I'll leave a comment on your blog post & if you're my favorite post I'll feature you on my blog by the end of the week. I'm still new to this whole link party thing... I meant to set last week's links to thumbnails but it ended up just a list and I didn't realize it until most of you had already linked up. Thumbnails are way better, I love seeing all your goodies in neat rows... so sorry, I'll make sure it's thumbnails this week but thanks to those of you who played along anyway! Since you didn't get to show off you handiwork in the link party I thought I'd feature more than just one of the links today. 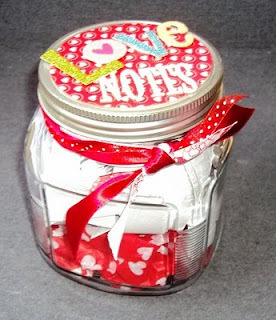 Did you see What Allie's Making for Valentine's day? Does anyone have a suggestion for how to store cut-out pattern pieces? I've been keeping mine in one of those boxes that's made to hold magazines... but they're unruley and every time I try to slide a new piece in, it gets caught on another one and bends. So I had this idea and I'm not sure if it's really much better, but I thought I'd at least give it a try. 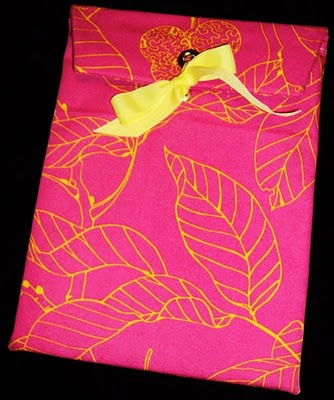 This is﻿ the Document Duvet from Amy Butler's In Stitches: More Than 25 Simple and Stylish Sewing Projects book. I made it with a decor weight fabric I bought on impulse at Ikea that seemed too "happy" for me to do much with after I got it home. The patterns I've bought at Jo-Ann's come in their own envelopes obviously, and even though they never fold up as neatly after you've used them, I still manage to cram them back into the envelope. Those will stay in the magazine holder box thingie. But, I don't have that many of those. Most of the pattern pieces I have are cut from tutorials, pattern files I've bought online, or designer patterns I've bought in fabric shops that don't come in the traditional envelope. So I'm thinking I'll put each pattern in a ziploc bag, label it with the pattern name, hole punch the top, put them all on a metal ring, and store them in my handy dandy fabric non-manilla folder I just made. Do you think it'll work? I'd love to hear how you store your patterns! It was so fun to see your links pop up on my link party, Your Way Wednesday, thanks! I loved finding new blogs and reading about what you all have been up to lately. Did you get a chance to check out the embellished tops Anne made? The store racks are full of ruffle designed blouses and dresses. It's pretty easy to get creative and make your own! 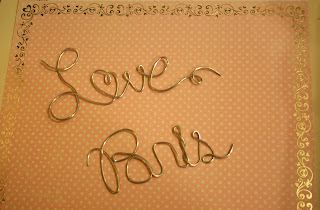 See Anne's way of duplicating this style on her blog, Anne's Antics. Please add my brand spankin' new, super awesome, it's beautiful... just admit it... Your Way Wednesday button to your blog or blog post. Please link to projects only, not items for sale, your Etsy shop, or your own link party. Only 3 rules, that's not so bad! 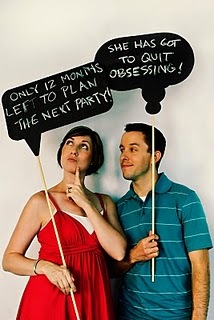 In exchange for following the rules, I promise to love you forever or follow your blog... whichever you prefer. I'll also leave a comment on the post you link to & feature my favorite linked post here on my blog in the next day or so. 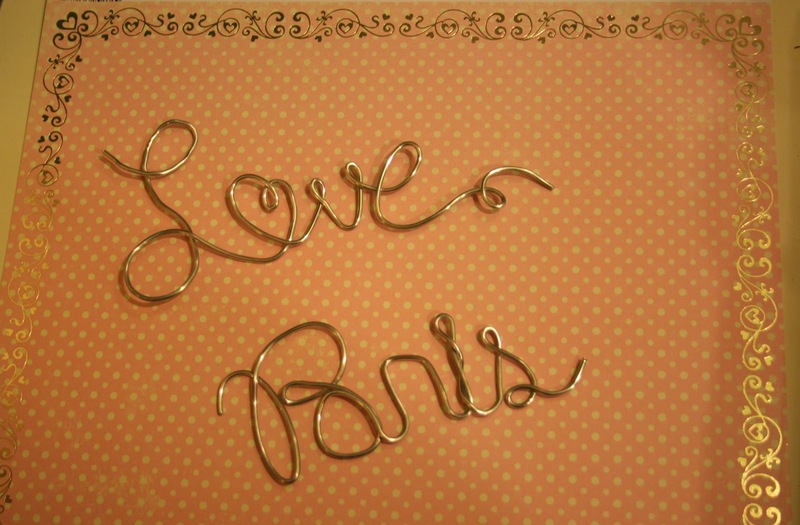 Oh please, you lovely fellow bloggers, please participate in my first ever link party... I'm so nervouse! I'm not waisting any time on my 2011 to do list! I've already got a big ol' check mark next to cover my kitchen stools. Now that that's out of the way, let's get to the good stuff.﻿ I flipped the stools over and unscrewed the 4 screws that attached the cushions to the stool frame. 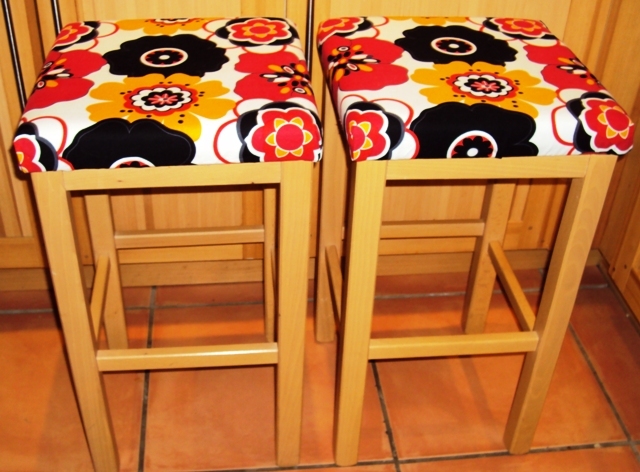 I found a fabric scrap (that was just barely big enough) in my stash that matches our kitchen decor and cut two pieces several inches bigger than the stool cushions. 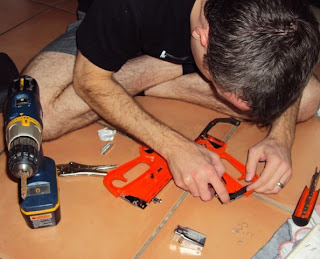 Okay, my Doug didn't really take the staple gun apart half way through the project... it jammed. Since I'm married to a man who adores me and does everything in his power to make/keep me happy, he set out on a mission to disassemble and reassemble my broken staple gun. Oh how I love this man, lucky for him it's for so many reasons other than his ability to fix broken things! He wrestled with it for almost an hour before he admitted defeat. So I moved on to plan B, a plain old office stapler. I couldn't believe it worked! I did have to take out a few not so perfect staples, but more times than not, it did just fine. Drum roll please... introducing, my first ever vlog! 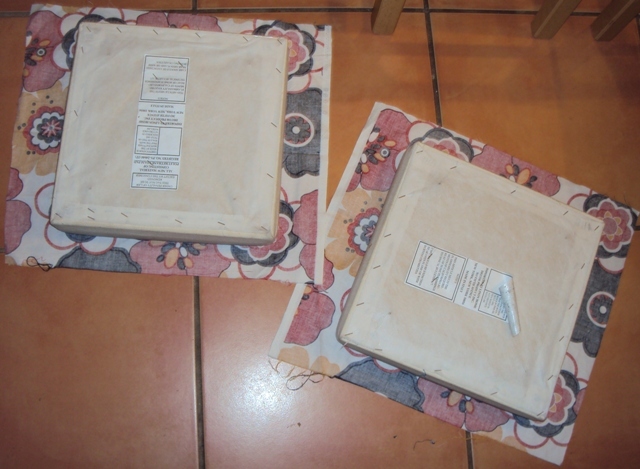 That's right, I took a video for you of how to staple the cover on and make a neat corner. Disclaimer: I took this on my precious (a.k.a. iPhone) by myself so I'm holding my phone in one hand and trying to fold the corner with my other... just sayin'! We're all just gonna ignore the fact that it's upside down... K?? I think we can all agree it was time for a little organization!﻿ Before we get to the "after" shot, I want to show you the supplies I've been working with. I don't get terribly creative with Elle's bentos (I considered adding 2 creative bentos per month to my 2011 to do list, but decided that was a lot of pressure for 6am in the morning and that I could get creative with things like lunch box notes & new foods instead... for now anyway) but these supplies have been more than sufficient to pull together a bento 3 days a week for the entire first semester of school. 2 - adorable little picks I absolutely love and use to dress up whatever boring or new weird food I have to sneak into Elle's bento. 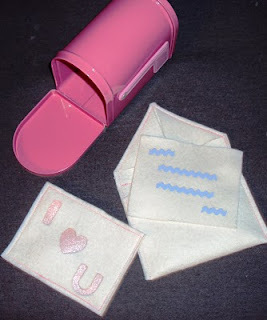 I got these from Daiso Japan which has some really great cheap bento supplies... I think it may be just wholesale though... if you do a Google search for Bento supplies you'll find lots though. 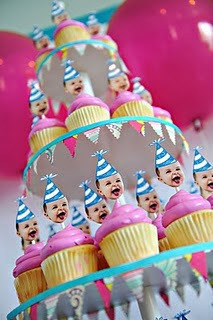 3 - I have entirely too many silicone cupcake cups! I do like having a variety of shapes, although I almost always just use the square ones, but you definitely don't need the quantity I have. You can pick these up at Michaels or Jo-Anne's in the cake decorating section or even at Target in the dollar bin section sometimes. 4 - I've picked up bento boxes at various places - the Disney store, Sanrio, the pink oval one is the Sassy brand box from the baby section at Target, and the green one is a box I picked up at Old Navy in the check out line (it's pretty big, so I mostly just send that one with my Doug). The insulated fuel mug is a new addition that I found at Publix for $5. It's nice to have a variety of sizes so you have a size that will fit the stuff you have on hand to send that day. 5 - Oh I love the little monkey containers! I found those on Etsy at a shop that doesn't currently have any bento supplies listed, but if you do a supplies search for bento, lots of fun things come up on Etsy. 6 - silicone dividers are a nice little thing to have in your bento stash! 7 - lastly, I have plastic forks & spoons. These came with a picnic set I had, but a lot of the bentos come with them (especially if you buy them at Disney or Sanrio) or you can find kids utensils pretty much anywhere. 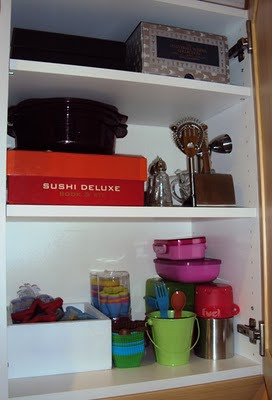 I moved the coffee supplies to a cabinet next to where the coffee maker is & filled the shelves with boxes of glass wear & sushi sets instead. I also pared down a set of stacking bowls that I only ever use 3 of anyway & more neatly arranged some serving dishes we very rarely use. The bottom shelf is all those supplies I showed above. 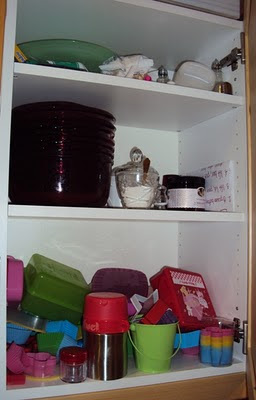 The white box holds all the cutters, the silicone cupcake cups are stacked neatly in their original packaging, a little metal pail corrals the picks and all the other little bits, and the bento boxes are stacked neatly in the corner. Organizing this cabinet should make making Elle bentos during her second semester even easier on me! Learn Illustrator - I've had my eye on this Illustrator class from Nicole's Classes for a few months now. 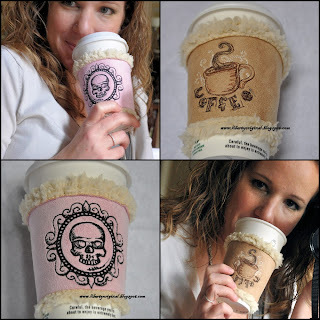 Oh the printables I'll make! My "now that I know Illustrator" to do list is lengthy, so I'll save that for when I actually cross that bridge. 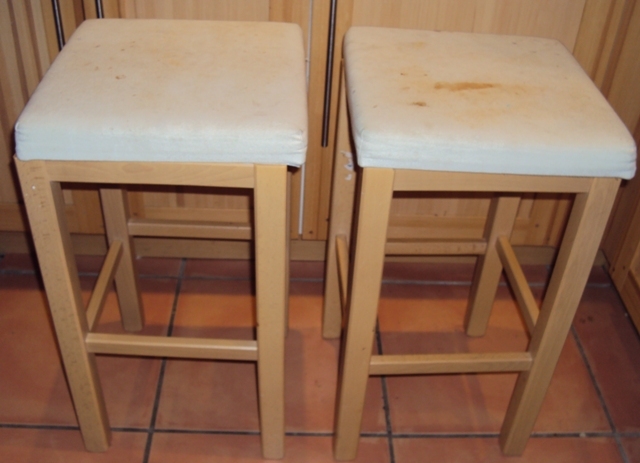 Cover Kitchen Stools - Compared to learning Illustrator, this one seems pretty easy, but I have two ugly kitchen stools that have needed to be recovered for at least a year and a half, so I'm committing to it right now! Host a non-birthday party - Every year we have a big celebration for each of my girls' birthdays, this year, we're going to celebrate something non-birthday related too. Will you help me decide on a theme? There's a poll in the right margin with a few of my ideas... vote for your fave or leave me a comment with an idea of your own! Make something for me to wear - The girls get lots of handmade goodies, but I rarely make anything for myself. I got Heather Ross' Weekend Sewing for Christmas this year and the Dressing Up or Down chapter has lots of cute dresses and separates to choose from... one of them will be mine this year! Make Liv's Baby Album - I didn't finish Elle's baby book until 2 weeks before Liv was born, I need to do Liv's album before I blink and she's 5 yrs old. This year I'm going to scrapbook her first year, that's only 24 layouts... it's not that much, I can do it (can you tell I'm psyching myself up for this one?!). So that's it... just 6 things to cross off my list before 12/31/11. What creative things are you going to be doing this year?